Peter Menzel is my favorite portrait photographer whose books I go through multiple times a year. His work is so rich that I see new details or understand something new each time. 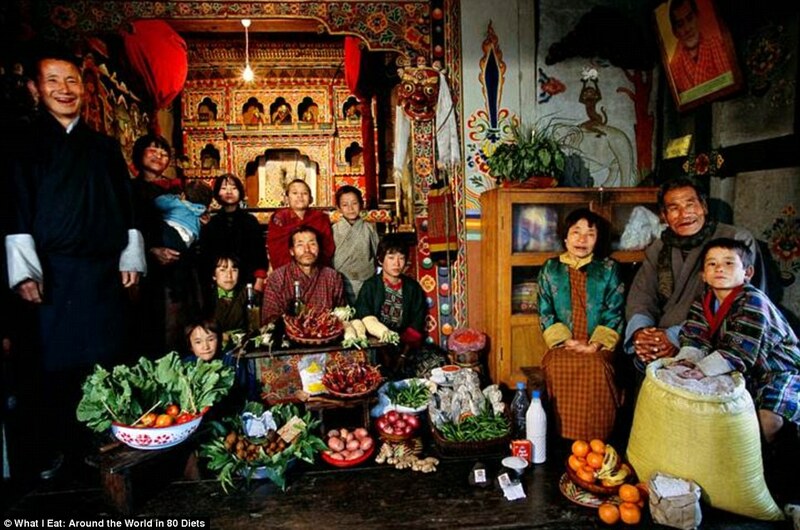 Last week, I noticed a curious detail on this portrait of a Bhutanese family (the Namgays of Shingkhey village) in Hungry Planet- a most excellent book which shows families around the world with their week's worth of food. On the bottom left of the tangerines, I spied a small packet of baking soda leaned up against two sheng mushroom cakes(looks like XG Bao Yan Holy Flame). 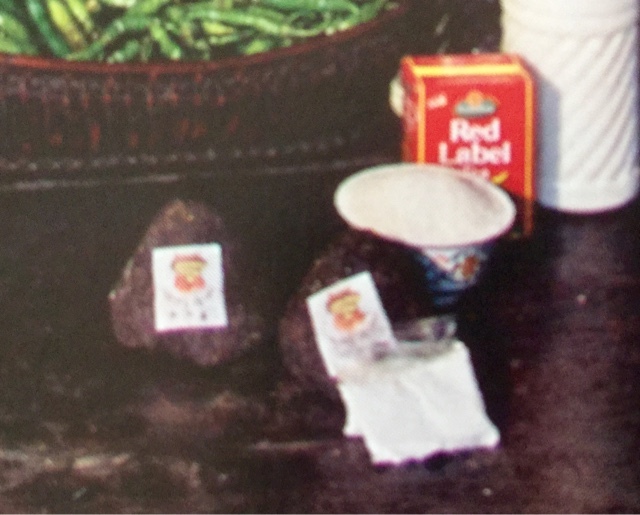 According the the text, the baking soda is "used to neutralize the acid in tea". You would think the yak butter would be enough to fulfill that role. The cost of the teas is listed as "$0.76" which also includes the Red Label black tea for "guests only". I squinted quite a few times and finally decided it must be sheng as it wasn't dark enough to be shu. For about $0.25 per mushroom, you can imagine the kind of gut wrenching sheng they drink. I've long known Southerners to add a tiny pinch of baking soda to sweetened iced tea to get rid of the bitterness of the tannins but I've never thought of applying it to sheng. Such adulteration is not for puerh purists but I'm all game. It's one thing if I was unknowingly served such smoothed out sheng at a tea house but I'll totally dope my own tea if it makes it better. It's been a long while I've done a controlled study that is lab worthy but today I'm just going for a rough conclusion. Is baking soda an enhancer worth considering like salt on corn on the cob? Milk and sugar are the universal tea enhancers but since they impact the fundamental taste too much, I would love to get my hands on a more invisible agent. How much should I sprinkle in? A smidgen, a pinch or a dash? In situations where proper dosage is unknown, the standard protocol is to start with the smallest amount and then add in increments. A smidgen did almost nothing so I kept progressively adding more until the taste of baking soda just about ruined the tea. My 04 XG was so plenty bitter than even an eighth teaspoon in a tablespoon of tea did not erase the bitterness. Once you add too much, you get that weird slippery coating in your mouth like you just swallowed swimming pool water. Should I add the baking soda to the brew or to the leaves? I added it to the brew so I can control it more. Does it just merely taste smoother or is it better for your stomach as well? Given people take baking soda for acid reflux, heartburn, and other stomach woes, I might do well to take a baking soda tonic(one teaspoon per cup) after a sheng session anyway. When you add baking soda to acidic liquids such as lemon juice- it fizzes. The sodium bicarbonate(baking soda) reacts with the citric acid of the lemon to produces sodium citrate and carbon dioxide bubbling up. When I added the baking soda to the sheng brew- no such fireworks took place in my teacup, but the color did deepen. I've read that Tibetans and Northern Indians add baking soda more to deepen the color of tea but I'm not sensitive to tint- I'm only after taste enhancement. I could dig deeper into the chemistry of sheng but that won't change the face that I didn't quite get results I was hoping for. The baking soda didn't dampen the bitterness much but subsequent sips did give a sweeter mouthfeel. It still doesn't make me want to brew up this XG more or drink it more. I thought perhaps the tea in the photo was shu not sheng so I also whipped out my XG shu mushroom but the baking soda made the taste worse. 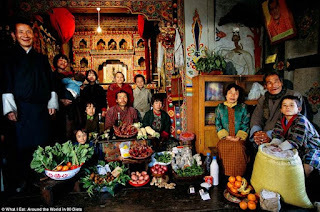 The Bhutanese family in the portrait are subsistence farmers and cash being scarce- they would not purchase anything regularly unless they perceived baking soda added value. For me I leave the baking soda for the other 101 uses. I opted for a seaside retreat last week to officially welcome the summer. The first thing my husband noted when we set foot inside our cabin- "This house smells like puerh. Wet storage." Spoken like a true puerh spouse. Strangely enough the mustiness of the cabin smelled exactly like a Guangzhou stored cake that needs a bit of airing. The cabin had such spectacular views of the Pacific, I decided to not be bothered. But being constantly assaulted by smell of (mildly) trad stored sheng dear reader is no way enjoy your precious vacation nor to whet your appetite for an aged sheng session. We had all the windows open. Summer in Northern California is a chilly affair requiring a goodly amount of fleece and I rarely peeled off except to dunk in the hot tub. I've tried a few times unsuccessfully to enjoy a sheng session by the sea. 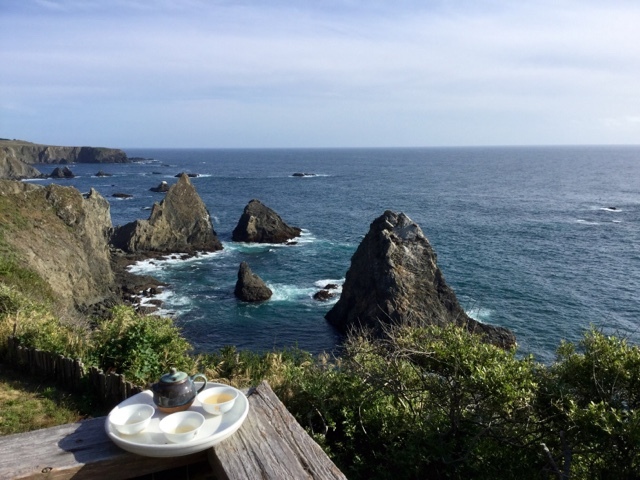 Perhaps the tea's interior mountain origin does not meld with the salty seaside air. Perhaps the blustery winds and white noise of the waves are too distracting. Most likely I was not used to the chemistry of the bottled water provided. Whatever the cause, teas I know I enjoyed somewhat just fell flat so I did not bother to brew up the last of the Hai Lang Hao Chawang Yiwu I brought to celebrate. I am going to give up on taking puerh to the seaside and stick with oolong and hongchas on such trips from now on. Sheng sessions are finicky as it is on home turf so the force of the ocean is just too much.